When users are getting serious need of highly accurate and clear dot projection at quite longer work distance than formal hand reach, formal power laser device or manual dot projecting tool can be workable at all. On contrary, on basis of advanced 445nm blue laser tech, beginning with high power up to 150mW to 500mW and separate design part of metal heat sink cooling system, high power blue dot laser alignment is regarded as a practically used dot positioning device. When high power blue laser gets easy connect with external electric power source and correct installation, it is easily achieving highly clear and accurate dot projection in distance efficiently. The operation of high power blue dot laser alignment is much similar with a laser pointer, however, it is required to generate continuous blue reference dot projection in any type of industrial and high tech dot aligning works. It is selecting external electric power source from DC input power supply, which is just leaving quite larger space reserving as its cooling system. This aircraft used aluminum alloy housing made blue laser module achieves superior nice thermal conductivity and improving beam stability in continuous work. 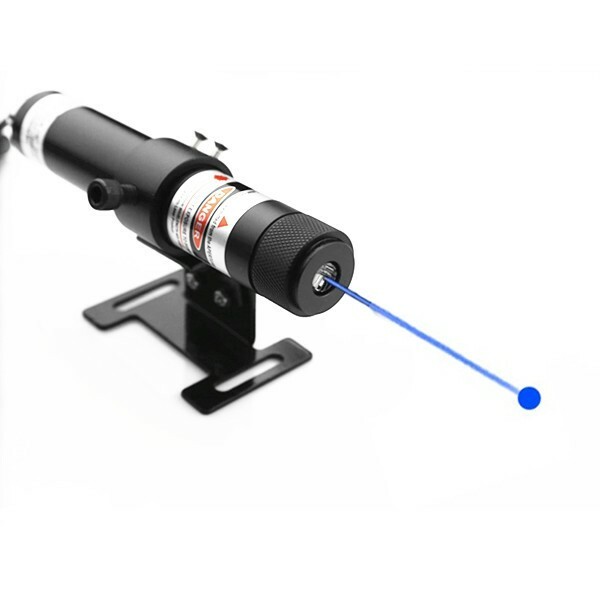 When blue laser dot targeting is processed under quite harsh working occasion, within wide range operating temperature of -10 to 45 degree Celsius, it is not affected at all, but also keeping work with the most stable blue dot projection, including harsh working occasions of mechanical shocking, moving etc. If there is quite serious need of highly stable dot alignment, high power blue dot laser alignment is being made with high attention to laser beam stability. It is not only getting high attention to thermal emitting system, but also getting the most important design part of APC, ACC driving circuit board. Even thought there is serious electric current impacting from bema aperture, however, this high power blue laser module is not affected at all, but just keeping the most reliable blue dot projection within daily use of 8 to 10 hours. Whatever kind of working surface it is pointed, high power blue dot laser alignment gets excellently designed glass coated lens. It is also equipped with front part glass window, under operation of dust or moisture, it is not affected at all, but just keeping highly clear blue dot projection on any raw material surface. If there is high intensity blue laser light generated from beam aperture, under operation of serious power and energy produced, it might cause serious hurt to human eyes. This alignment laser should be operated with proper wearing of 445nm wavelength preventing laser safety goggles, and then achieving easy and free use easily. It is always a quite complex job for users to get super clear and accurate line alignment out of hand reaching distance. However, until the time users are selecting advanced laser tech applied blue line laser module, it is able to generate highly bright and visible blue reference line in distance. When this laser line generator gets freely selected output power and optic lens degree, it will easily get satisfied line length and line thickness as expected. Besides its formal operation for industrial line aligning work, this charming light emitted laser line alignment tool would also make sure of clear line projection for special fields, including laser show, laser displaying, military targeting and others etc. Instead of prior time spending on line positioning with manual or mechanical line alignment device, once line generation is processed with blue line laser module, it is reduced relying on professional skills, but just making sure of rapid and accurate line projection on desired working surface effectively. It is adopting external DC input power supply as its electric power source, which is not only leaving enough space as its thermal emitting, but also easily getting continuous blue reference line targeting on any targeting surfaces efficiently. In quite long distance line alignment work, in order to obtain the most accurate line alignment, blue line laser module is employing the most qualified separate crystal lens. It is getting even better performance than formal plastic coated lens or glass coated lens. When laser line alignment is processed at quite long distance, it is still keeping the same line brightness and line thickness. When it is available with selectable optic lens degree within 10 degree to 93 degree, it is obtaining super fine blue reference line within 0.5 meter to 6 meters. According to very easy installation on any other device or equipment, within freely installed distance of 0.3 meter to 3 meters, blue line laser module is easily obtaining quite satisfied line projection result on any vertical or horizontal surface easily. Within daily operating time of 8 to 10 hours continuous use, with enough time reserving for laser module cooling down, this alignment laser always gets improving laser beam stability and excellent laser light cycling use in continuous work. In occasion that super powerful blue light and thermal energy are produced from laser beam aperture, users should wear 445nm wavelength preventing laser safety goggles and avoid eye exposure to beam aperture, it will make sure of highly secured and accurate line projection efficiently. In process of quite accurate line alignment on various targeting surfaces, it would be the hardest work for users to get quite clear and quick line alignment expected. In order to get much easier and more rapid line alignment at quite long work distance, it would be a quite nice chance to use a high intensity beam emitted blue laser line generator. Only according to free selection of output power and glass coated lens, blue laser line will easily maintain high line straightness, and then making sure of highly accurate line alignment on all targeting surfaces effectively. When the genuine line alignment is processed out of hand reaching, it is far more enough for users to only use a simple line drawing device or printing device etc. On basis of the use of import 445nm blue laser diode, available with import laser tech and wide range output power from 50mW to 100mW, this blue laser line generator is always keeping work with highly clear and visible blue laser beam at several miles far away. Under condition that the genuine line alignment is controlled within 25 meters, it can perfectly maintain high line thickness, and then making sure of super clear line projection in term work. Under condition that line alignment is processed, blue laser line generator is in need to generate different line thickness and line length in use. According to the adoption of qualified glass coated lens, it is not only maintaining high linear quality, but also available with different line length in use. When blue alignment laser line is available with different line length from 0.5 meter to 6 meters and keeping generation of quite charming and attractive blue laser light, it is just getting quite special laser line alignment for special work fields, including laser show, laser displaying, military targeting and laser medical treatment device etc. Instead of worrying about real work distance, high height and other hard reaching places etc, whenever the real use of blue laser line generator is seeking help with a laser alignment mounting bracket, it is always assuring quite convenient line generation on all targeting surfaces effectively. Blue laser line targeting direction is freely adjusted within three dimensions, and then making sure of quite convenient line projection in long term use. When alignment laser is workable for long term use, user should always pay special attention to powerful and intense blue laser light and wear 445nm wavelength preventing laser safety goggles, and then achieving highly secured line alignment constantly. In special need of highly accurate dot measuring work in those of high tech and precise device manufacturing work fields, it is always a super great challenge for users to make super accurate dot measuring result easily. When laser tech engineer is paying high attention to practical used dot aligning tool, such as a high power 445nm blue dot laser alignment, owing to excellent equipment with glass coated lens and basic thermal emitting system, it is easily obtaining super clear and bright blue laser dot targeting in distance. Whenever users are paying high attention to powerful and intense blue laser light, a correct output power made 445nm blue laser module is just able to achieve free and accurate dot measurement effectively. Usually the genuine dot measurement in formal industrial precise device manufacturing work fields is processed at quite long work distance, which is not realistic to fulfill highly clear result easily. Employed by high power 445nm blue laser diode within 150mW to 500mW, blue do laser alignment is keeping generation of the most intense blue laser beam and super clear blue reference dot at several miles far away. Every time users are making very simple screw of laser beam aperture, it just makes intense blue laser light concentrated, and then obtaining the clearest blue reference dot targeting immediately. When dot measuring work is processed for a quite long term, high power blue dot alignment would also be required to work with high level of laser beam stability. It is employing aircraft used aluminum alloy housing material, equipped with basic thermal emitting from metal heat sink cooling system, this high power blue laser module is obtaining super nice thermal conductivity, and always supporting highly stable blue dot targeting in long term use. For the most important of all, in order to get excellent laser light cycling use and reduced possibility of blue laser diode and electric driving circuit burning out, this blue laser should always be used within daily operation time of 8 to 10 hours. According to the design with glass coated lens, whatever kind of working surface, high power blue laser dot alignment is obtaining high laser beam transmittance. Even though blue dot is pointed at quite long work distance, it is still keeping highly clear blue laser beam and blue reference dot targeting in distance. On basis of high attention to powerful blue laser light and thermal energy, users should avoid eye exposure to powerful blue laser light and wear proper 445nm wavelength preventing laser safety goggles, and then making sure of highly secured dot aligning result constantly. If there is not quite efficient method for users to get quite accurate line alignment in distance, it is just a quite wonderful experience for users to make good use of high brightness high power blue laser line generator. This laser line module is a very nice line alignment tool, after its easy connect with an external electric power source and good design with thermal emitting system, it is easily getting highly stable and reliable line alignment in long term use. In addition, whenever the real line aligning work is processed without sunlight, users should only install this line laser alignment on correct place, and then it will get no mistake line alignment easily. When high power blue laser line generator is getting nice use of thermal emitting system, such as metal heat sink cooling system and aircraft used aluminum alloy housing material, it is getting excellent dual directions thermal emitting control. The adopting of copper raw material as its laser diode core part has also made great work to obtain superior nice thermal conductivity, and then getting highly stable line alignment in long term use. This line laser alignment tool is bearing super wide range operating temperature within -10 degree to 45 degree Cellules. Although sometimes line aligning work is processed under quite lower temperature, users can make quite simple preheating of laser module tube, it will recover its highly bright blue reference line targeting immediately. In order to get stable enough line alignment in long term use, this high power blue laser line generator is adopting even larger size tube with diameter of 26mm. It is always getting quite larger space reserving as its thermal emitting system. In order to make sure of super nice laser light cycling use, this line laser alignment tool is accepting operation within 8 to 10 hours per day, and then cooling down. When it is getting reduced possibility of laser module burning out or damage, under proper use by those of professionals or skilled users, this high power blue laser module will obtain extremely stable line targeting and quite long serving lifetime in use. On basis of the important design part of APC, ACC driving circuit board design, this high power blue laser line generator is always getting intelligent feedback of output power and power supply, and then obtaining constant blue alignment laser line targeting in long term use. When it is making good filtering of electric current, it will get perfect protection of internal laser diode, and then obtaining even more stable line targeting in use. At the same time, under condition that users are paying special attention to powerful blue laser light and avoiding eye exposure with proper wearing of laser safety goggles, this high power blue laser module will easily get accurate line targeting perfectly. Among a lot of industrial precise device manufacturing work fields, it is always a quite hard job for users to get super accurate dot alignment at quite long work distance. At the same time, from the time that formal laser diode is being made, laser tech engineer is also not stopping the step to develop more and more practically used dot alignment tool. As a result, once constant work on practically used laser device is available in type of a blue laser diode module, it is just generating highly accurate and precise blue laser dot targeting in distance. According to quite easy connect with external electric power source, this dot laser alignment always makes easy and high speed dot instruction on all working surfaces effectively. From the beginning design of blue laser diode module, it is just getting similar structure as a blue laser pointer. However, not the same as formally used alkaline battery power source, in order to make constant dot alignment in long term use, this blue laser dot alignment tool is just adopting external DC input power supply. AC/DC adapter is just converting wide range input voltage of 100V to 240V into 3V DC power source, The electric wire is passing through quite special varnish treatment, and then assuring the most stable dot alignment performance under strong interference or strong static etc. No matter what kind of working surface, there is always a lot of working place where human hands cannot reach easily. However, not the same as a mechanical dot aligning tool or other manual dot targeting tool, the real use of blue laser diode module is always getting no barrier caused by work distance, height, corner or others etc. This dot laser alignment tool is adopting quite durable aircraft used aluminum alloy housing material and copper material made 445nm blue laser diode core part, under constant dot aligning work, it is just working with super nice thermal conductivity and reliable dot aligning performance under strong interference or strong static etc. Owing to the employment of import 445nm blue laser diode, this high power blue laser diode module is always getting superior stable and reliable dot alignment in long term use. When it is getting good cooperation with APC, ACC driving circuit board, this alignment laser just keeps constant output power supply and the most reliable dot aligning with high laser beam stability up to 80%. Whenever blue laser dot is pointed on different working surfaces, it is always a key point for users to wear proper laser safety goggles and avoid eye exposure. Only if it is getting correct installation and adjustment of laser beam focus and dot targeting direction, it is making sure of no mistake dot alignment in long term use. Without worrying about line alignment accuracy, whenever 445nm blue laser line generator is being used for modern time industrial machinery processing work field, it is just bringing users an easy and high speed line alignment on various working surfaces. This laser line module is being equipped with qualified glass coated lens so as to get highly straight and good linear quality blue reference line all the time. When this laser line module is getting the employing of larger optic lens degree of 110 degree, it is able to obtain the longest line length of 6 meters in use. Without worrying about line alignment accuracy, this 445nm blue laser line generator is always getting even better line aligning performance than those of manual line printing tool or mechanical line aligning tools etc. It is getting fixed output power and optic lens degree, which has just made blue laser module obtain fixed line length and line thickness in use. If users are not know how to select a laser line device, users should try to know desired line length and thickness at required working distance. Laser tech engineer would make nice recommendation of optic lens degree and output power for this blue laser module, and then obtain high accuracy line measuring result effectively. Anytime 445nm blue laser line generator is being used for long term continuous line alignment work, it is always key point to assure its stable enough line alignment in long term use. It is adopting dual thermal emitting system, including inside tube made metal heat sink cooling system and thermal conductive aircraft used aluminum alloy housing material. In process of long term continuous line alignment work, this blue laser module is getting nice thermal stabilization, and also bearing wide range operating temperature within -10 degree to 45 degree Coleus. When laser line alignment is processed under harsh working occasion, this blue laser module is compactly made, and bearing all kinds of mechanical shocking, calibration or moving etc. Owing to its high power range of 50mW to 100mW, 445nm blue laser line generator is always workable for quite long work distance and high lighting work fields. In order to avoid laser light decay or blur in long term use, the real laser line alignment should just avoid sunlight, and making full control of real line alignment distance within 25 meters. When high intensity blue laser beam is emitting from beam aperture part, it is important issue for users to wear a pair of laser safety goggles, and then getting the most secured line alignment perfectly. Whenever user are trying to make super accurate cross line targeting in distance, it is always a quite hard job for users before correct selection of a high brightness blue cross laser alignment. Not the same as any other manual cross line aligning tool, such as a blocking board or triangular meter, this cross line laser module device is just operated without control of human manual labor force or professional skills. 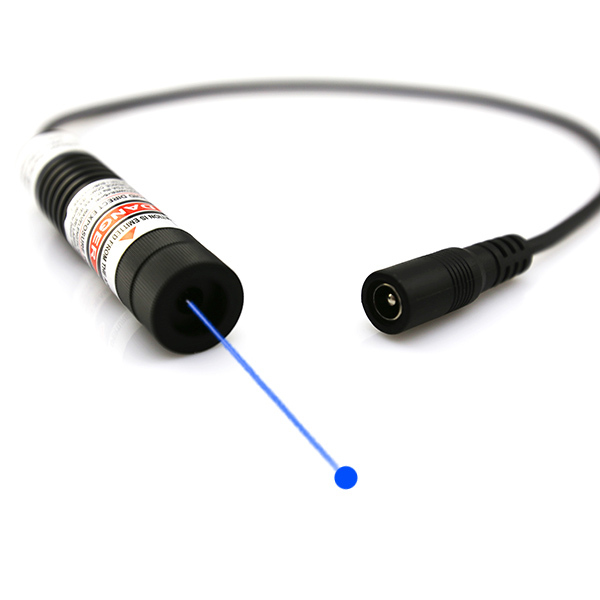 When users are selecting correct output power and optic lens degree, this high power blue laser module is just easily obtaining super accurate and clear measurement effectively. Without worrying about real work distance, the operation of blue cross laser alignment is just beginning with quite high power up 50mW to 100mW, which is just workable for quite long work distance with high intensity blue laser light during process of continuous cross line aligning work. In order to get quite stable cross line targeting in long term use, this blue laser module is adopting nice metal heat sink cooling system, which is just getting better performance than those of laser pointer equipped air cooling system. In addition, according to its better corporation with metal housing, this cross line laser module is just obtaining extremely nice thermal conductivity, and then obtaining the clearest cross line targeting in long term use. In order to make sure of clear enough cross line source generation on various targeting surfaces, blue cross laser alignment is adopting high quality glass coated lens as its laser beam emitting source. When blue cross line is keeping high linear quality and available with different lens degree of 10, 15 and 110 degree, it is just easily obtaining different cross line length, while still keeping accurate 90 degree two perpendicular lines generation in distance. When users are relying on cross line alignment with such kind of 445nm blue laser module device, it is just saving a lot of time on prior manual cross line positioning work, avoiding mistake caused by manual operation and reduce time and manual labor force input for real cross line alignment work. No matter what kind of industrial and high tech cross line targeting work field, blue cross laser alignment is always used as an accessory part, but not being used separately. When it is designed with only 16mm diameter aluminum alloy tube, it is just easily carried and installed on any other industrial machine or device, and then easily getting cross line generation without barriers at all. Owing to its quite high power range of 50mW to 100mW, it might also produce thermal energy as well as high brightness blue laser beam from its beam aperture part, users should just remember to wear a pair of laser safety goggles, and then obtaining the most secured cross line targeting perfectly.